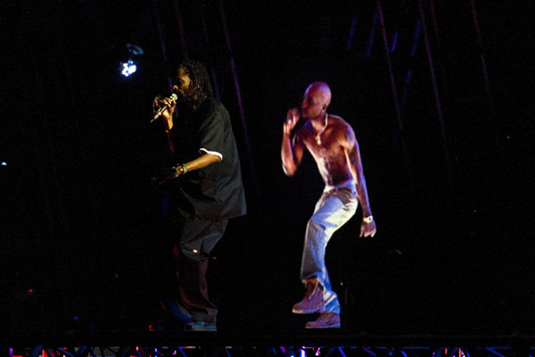 Dr Dre and hologram (sic) of Tupac Shakur. If I’m free on 17 November, I can go to the Regent Theatre to watch “Abbamania,” where lookalikes perform note perfect renditions of the ABBA songbook. On the same bill, just to cover the bases a little more widely, I can also hear impersonators of Cher and the Bee Gees knocking off the greatest hits of those star personalities. Yes, tribute shows seem to be all the rage these days. Either the original acts no longer exist because of death or retirement or tickets to see them, live and in person, price at intergalactic levels. If you purchase tickets to see a star act, you are paying for the dubious privilege of a brief sighting of a speck from the distant edges of some temporarily repurposed hockey arena. By this measure, seeing an ersatz act at the Empire or the Regent begins to seem like not such a bad deal. When it comes to tribute acts, mark me down as prissy. I would sooner listen to recording by the original artist than marvel at how faithfully his or her repertoire replicates. I can reserve my purchasing power for a live performance by a relative unknown want-to-be. ► The hologram is actually Pepper’s Ghost. Yes, the tribute business is now going to get much busier, thanks to the 30-years-dead Roy Orbison. Orbison, revivified on a 28-city tour of the US and Canada, is almost as good as alive. He has already played Toronto. This feat is possible by his performing as a 3D hologram. Filmed sequences blend with hologram technology to produce a chimera that sings, plays the guitar and speaks to the audience. To make things a little more lifelike, a 30-piece orchestra backs up the hologram. Just between you and me, the Orbison hologram is actually Pepper’s Ghost, a widely used nineteenth century illusion, not a true hologram. Having already completed a European tour, the hologram qua ghost and orchestra will eventually take up residency in the Andy Williams Moon River Theatre in Branson, Missouri, where the stars all have their own theatres. Ah, Andy Williams, how quickly they forget. The studio responsible for creating the Orbison show is supposedly working on a recreation of the late opera star Maria Callas. Does this mean we are now in for a wave of tours? Will a hologram qua ghost of Duke Ellington reappear and lead a live orchestra in “Mood Indigo” and “Take the A Train”? Will we soon be going out to see the Glen Miller lead his orchestra in “String of Pearls” and “In the Mood”? If the hologram qua ghost thing takes hold, maybe the Rolling Stones, fronted by a 75 year old Mick Jagger, who once remarked “I'd rather be dead than singing 'Satisfaction' when I'm 45,” would prefer to invest in reproductions of themselves and send the holograms out on tour while they sit home and collect the revenue. Maybe the Stones in the hologram can be thirty-year-old. Maybe they can work Brian Jones back into the act. Maybe Ethel Merman could return to us just because she was one of a kind and we miss her. Maybe an audience-averse Glen Gould would not turn over in his grave if he reappeared for public performances as a hologram. Maybe I will one day be able to order up a custom hologram concert in my home featuring Stephane Grappelli and Django Reinhardt. If holograms really start to take hold, will holograms acts, which don’t deserve eternal life, inundate us? Will I have to settle for Al Martino, Vic Damone and Jerry Vale holograms at the Regent because Nat King Cole, Perry Como or Johnny Mathis holograms are filling the Sony Centre? If all the acts that ever were, reappeared as holograms and start clogging up the public stages, what chance will new human performers have of catching on with a broader audience? There are thousands of performers whose talent outstrips their fame and a, star such as like Lady Gaga, may not be born because she has been crowded out by a tribute act or hologram qua Pepper’s Ghost. ► Worse than backing up a zombie. Although I admit I haven’t seen one live, mark me down as prissy about holograms as well. In fact, I find the whole concept quite creepy. Do you call a hologram him, her or it? Can you ask a hologram for an autograph? Does he, she or it trash hotel rooms? Does she, he or it respond to hecklers? How do our unfortunate thirty musician friends feel about backing up a hologram; worse than if they were backing up a zombie, I presume.